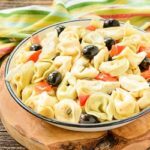 Make tortellini salad for your next gathering or to take to a potluck. It's cheese pasta, olives, peppers, artichoke hearts tossed with a homemade dressing. While tortellini is cooking, make the dressing. Whisk together white wine vinegar, red wine vinegar, lemon juice, mustard, salt, sugar, Greek seasoning, black pepper, and cayenne pepper in a medium bowl. Slowly add olive oil while whisking. Place cooked and drained tortellini in a large bowl. Add artichoke hearts, olives, bell pepper, and capers. Add about a half to three-quarters of dressing and gently toss salad to combine. Reserve remaining dressing. Tortellini salad is best served on the day it is made. The pasta will soak up some of the dressing as it sits. Add more dressing if needed. If made a day in advance, keep refrigerated. Bring to room temperature prior to serving (the olive oil will congeal when it is chilled). Amounts of artichoke hearts, olives, bell pepper, and capers can be adjusted to your preference.